South Pasadena’s Bunny Museum currently holds the largest collection of rabbit stuffed animals than any other place in the world. This world-record holding museum originally opened in 1998, and their slogan is very appropriate: “The hoppiest place in the world.” Even celebrity Elijah Wood took a tour of the Bunny Museum. You can check out some of his videos of the experience here. At the Bunny Museum, curators believe that bunny rabbits aren’t just an Easter occasion. According to the museum, there are bunny references everywhere: dust bunnies, rabbit ear antennas, and rabbits being pulled out of a magician’s hat. The museum is an ode to all things bunny, from the obvious Easter references, to this lesser known facts. The museum is a non-profit corporation, and there’s so much more than just plush bunnies to touch here. For just $8 (or free for members), you can touch and feed real bunny rabbits, and even bring your own bunny if you have one. Although there is a fee for admission, visitors are still required to make a reservation in advance. The Bunny Museum was established in 1993, and the story of its opening is just as interesting as the museum itself. A boy (Steve Lubanski) gave a plush bunny to a girl (Candace Frazee), and they eventually became a married couple built on the foundation of the art of bunny gift-giving. After Steve gave Candace the first rabbit as a gift (as an homage to her nickname, “Honey Bunny”), they made it a tradition to give one another a bunny-themed item every single day. 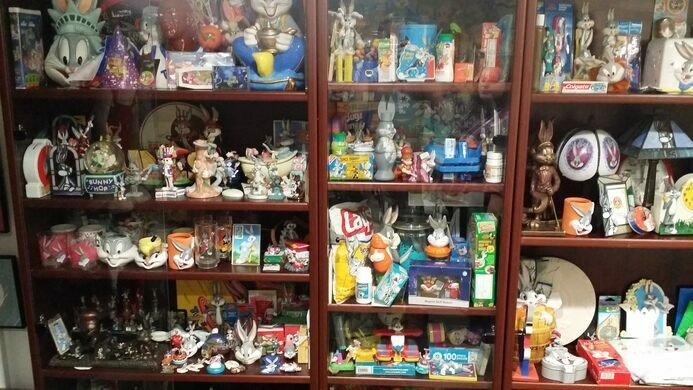 As you can imagine, the tradition ballooned into quite the collection, and they eventually amassed a collection of over 8,000 bunny items. At this point, they opened their home to the public to share their collection with others. Eventually, they moved to Pasadena to Alameda, where they currently hold over 34,000 items. The displays are currently on exhibit in “salon-style,” which means they span floor to ceiling. Though initially this style of display–which originated in Paris in 1667–may seem chaotic, there’s a particular type of order and cohesive flow that guests can easily take notice of. Thanks to the salon style of display, there’s always something to look at. Among the more stranger exhibits include the freeze-dried bunnies, which were once household pets that are now situated in a display case. Guests 13 years and older who have a particular affinity for bunny rabbits can join the Paw Patrol, a daily committee that helps clean litter boxes for bunnies and cats, vacuum, groom, feed, and clean bunnies and cats. Paw Patrol takes place throughout the day in half an hour shifts. Guests can also bring fresh fruits and vegetables for the animals, although carrots are not allowed. The Bunny Museum provides carrots themselves, to prevent guests from bringing only carrots and thwarting a versatile diet for the animals. The museum earned itself an entry in the world’s best curated book of all things unique, the Atlas Obscura. According to Atlas Obscura, the couple plans to eventually locate to an even larger space.